Brisbane's first suburb was Kangaroo Point, across the river from Brisbane Town. It rivalled South Brisbane, firstly for industry and then for residential sites. One of the early real estate investors was a Sydney man, Joseph Thompson, who held considerable assets in the area, including the semi-detached Silverwells. Next to Silverwells, Thompson had the house pictured below constructed. He called it Sunnyside. 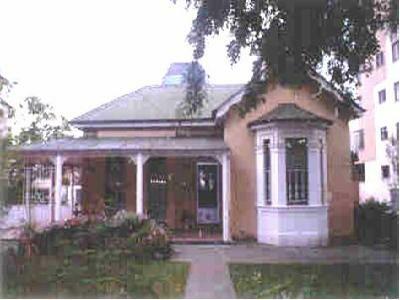 The house was built in the mid-1890s overlooking the river with direct views to the city. Thompson was an investor rather than a resident, and the land between the house and the river was leased to the shipping firm AUSN who built workshops there, within easy reach of their office in Mary St in Brisbane. One of the tenants was Charles Foster of the ironmongery firm, Foster and Foster. He moved to Sunnyside from his former residence Shafston House, which he still owned. Woah! Not all refurbs are improvements. Such a shame that the fence in front of Sunnyside is such a barrier that there's no possibility of being able to see this heritage-listed building. How did you take the photo? You must have had a ladder! It's a pity, too, that the colour scheme is so non-heritage.